The impact of Alien is undeniable, and with Prometheus breathing new, terrifying and artistic life into the saga, Alien's legacy could go anywhere. However, Alien didn't spring, fully-formed onto movie screens as the near-perfect Star Beast that it is. Alien was, upon its release, and remains to this day, a very rare beast. Ridley Scott's 1979 fierce film has all of the elements of a low-budget B-Movie (it's a sci-fi film, a horror film, a creature feature, a space opera, and a psychological experiment in terror) in spite of the fact that it has gone on to become that elusive critically acclaimed blockbuster and multiple award winner (including an Academy Award for Best Visual Effects). At its core, Alien is a haunted house movie with the ultimate nightmare for a ghost and a “mansion” set in a far more desolate place than merely a remote estate or a clearing in the woods. The tagline said it all: "In space no one can hear you scream..."
No matter what you define Alien as, there is no evading or denying the definition “complete success”. Alien stands as a classic even amid decades of sequels, prequels, adaptations and more impressionistic imitators than a convention of Rich Little impersonators could keep track of. The imitators of Alien started well before the official entries in the saga. Much like Dawn of the Dead (released in Europe as Zombi) was immediately followed by the unrelated Italian entry Zombi 2, Alien was followed in 1980 by the unrelated (and vastly lower-in-quality) Italian sequel Alien 2. That may have seemed laughable at the time (and since), but Alien 2 was recently released (with title intact) on Blu Ray. The first of the (official) sequels, James Cameron's 1986 Aliens stands as the most respected and acclaimed of the followers, with its only real rival being Ridley Scott's own prequel, Prometheus (2012). The impact of Alien is undeniable, and with Prometheus breathing new, terrifying and artistic life into the saga, Alien's legacy could go anywhere. However, Alien didn't spring, fully-formed onto movie screens as the near-perfect Star Beast that it is. Just as Star Wars evolved from a long line of pulp, comic strip and serial influences, a web of tributaries helped create Alien and has helped it to become more than the swelling, roiling sum of its parts. So what were these decidedly alien Alien antecedents? They range from some passing similarities which could suggest a connection, to the undeniably linked and influential properties that could not possibly be coincidences. Also, like Star Wars, it should be noted that many of these influences were, in turn, inspired by stories that came before. Sure, Flash Gordon influenced Star Wars, but A Princess of Mars, Gulliver's Travels and more helped shape Flash Gordon! How far back can we honestly take the inspirational family tree until we're all analyzing cave paintings for familiar themes? Still, some influences on Alien are more direct than others. 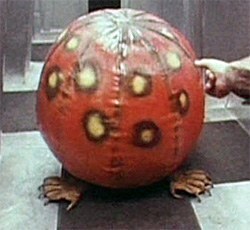 Case in point: John Carpenter's 1974 film Dark Star. Like most of Carpenter's films, Dark Star proved to be better than it had to be, so when his little student film picked up theatrical distribution, he had to expand it to feature length. The majority of this expansion took the form of a second act in which the hapless Sergeant Pinback stalks (and is stalked by) a mischievous extraterrestrial with large, sharp claws that the crew should never have allowed onboard. Although Dark Star and Alien have different origins of and resolutions to their monster problems (not to mention the Dark Star alien is a beach ball, aside from those claws), the connection between these films is far from dubious. The key to the connection is the fact that the character of Pinback is portrayed by one Dan O'Bannon, who co-wrote Dark Star with Carpenter. The second film O'Bannon co-wrote (this time with Ronald Shusett) was Alien. O'Bannon and friends were open about to the fact that Alien, although better funded and wider in scope, was, in essence, the second act of Dark Star, expanded to feature length. Rolling back almost a decade before Dark Star was a 1965 Italian sci-fi horror film called Terrore Nello Spazio (Terror in Space), better known by its American release title Planet of the Vampires. Mario Bava's inventively low-budget B-Movie came out a full year before Star Trek, and debuted on the very same day of Lost in Space's premiere but featured elements that much more closely resembled 1979's Alien. A futuristic spacecraft receives a distress signal from a smoky, desolate planet. 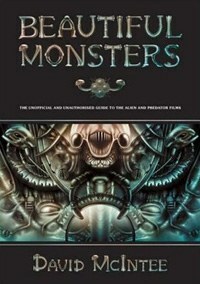 There, the crew finds a crashed space vessel and an inhumanly large, monstrous skeleton along with a unique method for the malevolent alien forces to gain access to the protagonists' ship. Stop me if you think that you've heard this one before. An Earth spacecraft travels to an uninhabitable planet to investigate a crashed ship on the surface. There, a frightening creature stows away on the new ship, hides itself and patiently waits in the shadows to pick off the crew one by one in its hungry, terrifying way. The isolated crew do all they can to fight off this unfathomable beast by improvising weapons and crawling about the ship's air shafts to track it. But who could believe such a terrible thing could be real? No, I'm not simply reminding you of Alien's plot. That is actually the plot of 1958's It! 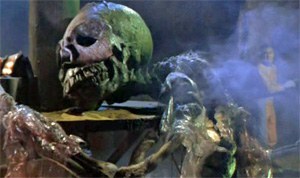 The Terror from Beyond Space which was almost old enough to drink alcohol legally when Alien debuted. Like Alien, director Edward L. Cahn and writer Jerome Bixby's It evokes much of the tension and mystery of Agatha Christie's And Then There Were None, and maintains an added question about whether there truly is a monster at all, or if there may be a human murderer on board. Spoiler warning... It's not human. One decidedly overlooked influence on Alien is Universal Studios' 1954 horror classic The Creature from the Black Lagoon. The crew invades the title monster's domain on a scientific mission not in a spaceship but on a boat. The monster is revealed very slowly a piece at a time, much like Alien's title star beast and when we see it, we become witness to one of the quintessential movie monsters in horror history. There is a reason that The Creature from the Black Lagoon, whose debut was decades after The Wolf Man, Frankenstein and Dracula, is still considered one of the Universal Studios greats, along side these recognizable icons. Just as Alien's crew is trapped on their starship, unable to escape the nightmare that is picking them off, the Black Lagoon crew is powerless to leave the confines of their expedition boat as the “Gil-Man” appears over every side of the boat to pull them down to his watery hell. They may not be in space, but there is nowhere for the crew to run in this forgotten spot in the South American wilderness. The 1982 neo-classic The Thing (also directed by John Carpenter) is often spoken of in the same breath as Alien and the two films are often considered two scary riffs on a similar genre. The similarities are not exactly coincidental. Both The Thing and Howard Hawks' 1951 original The Thing from Another World take their story from the 1938 John W. Campbell, Jr. novella "Who Goes There". Carpenter takes many cues from the 1951 film, but the shape-shifting monster of the 1982 film originated in the 1938 novella with very little suggestion in the 1951 film. 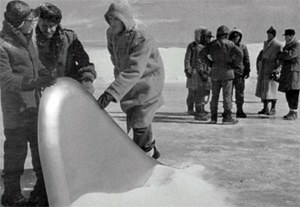 Instead, The Thing From Another World revolves around a team of explorers in the harsh terrain of the Arctic Circle coming across, you guessed it, a crashed spaceship. The lone inhabitant of the derelict ship comes to life inside the research outpost and becomes an almost entirely unseen stalker, taking life after life as the dwindling survivors are forced to improvise defensive weapons much like they did in It! The Terror from Beyond Space and, of course, in Alien. The frozen landscape surrounding the North Pole is every bit as desolate as deep space and is every bit as inescapable as a starship. In both cases, to leave the confines the characters share with the monster would mean certain death. It's a terrifying trap, to say the least. While Alien does bear much more of a resemblance to the 1951 film than its literary source, another book is not only cited as an influence on Alien, but was grounds for a lawsuit against Alien's distributor 20th Century Fox. A. E. van Vogt's space opera anthology The Voyage of the Space Beagle (1950) is not about a spacefaring canine, but takes its inspiration from Charles Darwin's five year mission aboard the HMS Beagle and his subsequent book The Voyage of the Beagle. Space Beagle is rumored to have influenced Star Trek, It! The Terror from Beyond Space, the Final Fantasy video games and the “Dungeons and Dragons” series of role playing games. However, chapters in Space Beagle include depictions of an inhuman extraterrestrial infiltrating the Beagle and hunting the crew as well as another alien implanting parasitic eggs within the bodies of the Beagle's crew that, upon hatching, eat their way out of their human hosts. Does that sound like Alien? Van Vogt thought so, to the point that he filed a plagiarism lawsuit against 20th Century Fox. The suit had enough warrant for Fox to reach a financial settlement with van Vogt out of court. Meanwhile, O'Bannon denied any Beagle influence. That said, there's no evidence that Charles Darwin or his heirs ever attempted a lawsuit against van Vogt. Highly evolved, indeed. The influence of Haunted House movies on Alien has always been underestimated or overlooked entirely, but should not be because, setting be damned, this influence is written all over Scott's movie. The plight of the Nostromo crew in Alien is remarkably similar to that of the victims in any given Haunted House movie. The horror trope of the take charge leader (who becomes Purina Alien Chow) can easily be seen in Tom Skerritt's character of Dallas. The altruistic first victim is exemplified in John Hurt's able Kane, while Yaphet Kotto's Parker and Harry Dean Stanton's Brett serve as the tough working-class wise-crackers we see in every third horror film. We even get our iconic turncoat in Ian Holm's Ash, our frail victimized scream queen in Veronica Cartwright's Lambert and even our “Final Girl” in the (eventually) tough-as-nails survivor, Sigourney Weaver's Ripley. Many of these previous works, directly or indirectly, have impacted Alien and the subsequent films in its series, but even some of Alien's contemporaries (or immediate predecessors) have been cited as either an influence or part of a similar wave. The '70s marked an experimental time in popular art. The hippie era was dying out right around the same time that the old studio bosses were retiring. Concept rock albums and high-concept popular movies both took over their charts and kept the sight and soundscape sharp and surprising. George Lucas' 1977 re-creation of the swashbuckling sci-fi serials of the '30s took the name of Star Wars and was an instant hit that remains unprecedented in its popularity to this day. Unlike most science fiction of the past, including Star Trek, Buck Rogers and even Planet of the Vampires (all of which primarily showed us pristine and polished idealized futurism), Star Wars employed a realistic, scratched and dusty “used future”. Robots were often caked with dirt and impossible technology that would ordinarily be presented onscreen as shiny and perfect was shown to be cracked, drab and worn, like equipment any real farm boy might be expected to use. Ridley Scott was influenced by Star Wars to create his own “used future” for his “Space Truckers” to inhabit. What we see is a world of tomorrow with practical tools and likely, even expected wear and tear thereon. 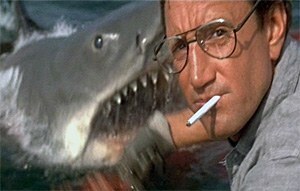 While “Gil-Man” might have been merely defending his home and the shark from Jaws may have been a mindless monstrosity, the Alien from Alien was a killing machine of a different order. Inhuman, certainly, but with a huge question mark surrounding its mindlessness. In fact, like some of the best movie killers, the alien seems to be in complete control, unstoppable with a creepy silent intelligence. If you think that sounds more than a little bit like Michael Myers, the slasher from Halloween, you're not alone. These similarities have been pointed out by scholars and critics like Roger Ebert since Alien's debut. Are the similarities between Halloween and Alien a stretch? That would be doubtful, considering the fact that Halloween was directed and co-written by John Carpenter, co-writer and director of Dark Star, fellow devotee of The Thing from Another World (which is actually watched on TV during the events of Halloween), former classmate and continuing friend of Dan O'Bannon's and, according to O'Bannon, the original choice for director of Alien (back when it was planned as a low-budget thriller with the working title of Star Beast). One of the many rumored inspirations for the title Alien and its lifecycle includes the ichneumons wasp which lays its parasitic larvae inside other insects who serve as the food for their young upon hatching. This same real-world monster inspired the insectoid monster in the 1975 Doctor Who serial “The Ark in Space”. 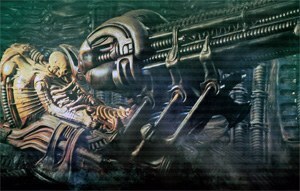 Space Jockey (the giant skeleton found in Alien). The similarities do not begin or end with this bug, either. As the Doctor and his companions investigate a derelict space ship, they come across a large, dead alien monster, much as we saw in Planet of the Vampires and (later) Alien. One of Alien's more realistic and believable aspects is the use of cryogenic sleep pods to preserve the crew on long journeys. “The Ark in Space” is so named because the entire craft is essentially one big sleep ship with the entire crew in hibernation. As the crew starts to awaken they realize that many of them are hosting alien insects known as the Wirm, whose larvae have been laid inside them. The only way to get around these newborn monsters is to traverse the Ark's service conduits to utilize their improvised weapons against the growing insect swarm. And so it would seem based on the evidence. However, just as Alien's script is a conflagration of a great many sources, so was the final film the group effort of a great and diverse cast and crew. Many of the sequences in the final film were not what O'Bannon and Shusett had in mind and did not exactly meet with their approval. Likewise, much of the imagery was contributed by Ridley Scott and designer (and nightmare weaver) H.R. Giger well after the script had been finalized and turned in. 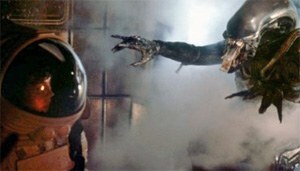 Alien remained a work in progress until its debut and beyond (when one looks at the 2003 “Director's Cut” of the film). In short, while many of the elements in Alien did not start with Alien, it's reasonable to argue that Alien perfected these elements both by making each one sharper and more artistic and by combining these elements into a fascinating, enthralling, dark, deep whole. These elements may not have been new in 1979, but the way they were combined and enhanced was nothing short of original. Much like Lucas with Star Wars, O'Bannon, Scott and company can hardly be accused of “stealing” (as O'Bannon put it). The most they can be accused of (or, more accurately, complimented with) would be recombinant alien DNA. 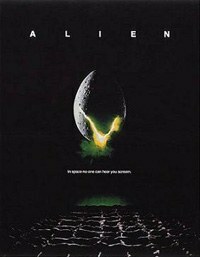 Alien remains critically acclaimed (even winning over early naysayers like Roger Ebert himself in the subsequent decades since its release) and has made almost ten times its budget back at the box office alone. Alien also has one of the most acclaimed and successful sequels of all time in Aliens, and even more surprisingly one of the most acclaimed and successful prequels of all time in Prometheus. Considering the fact that Alien has, to date, three prequels and three sequels (not to mention countless imitators and followers) without the original becoming a diluted relic, clearly this great combination of elements has worked. Alien is less a “B-Movie” at this point and is that very rare beast that floats somewhere in the space between “art film” and “blockbuster”. See you in The Next Reel, true believers... keep watching the Skies!